“But how do you afford to travel?” is one of the most frequent questions not only from people at home, but also from others on the road. Most people I meet are on some sort of an extended holiday – usually 3-6 months, but sometimes stretching out as far as a year. Occasionally I’ll meet another digital nomad, and we always garner raised eyebrows from those headed home to find a job. But as I mentioned before, traveling while working is much more cost efficient than working from home. How did my first month pan out? Using the Trail Wallet app on my phone I tracked all of my expenses for the 31 days I was in Cambodia. First off – this app is great. It lets you set a budget, categorise purchases and quickly and easily swap between currencies. The currency swap is great for me, especially since Cambodia officially uses the riel, unofficially (but usually) uses the American dollar and I am drawing from my savings which are in Swedish crowns. My only complaint about the app is that it has little taunting messages when a day goes over-budget like “Hope it was worth it…” written in red. This just makes me want to shake my phone and say “Well bus tickets can be pricey, cut me some slack! !” Luckily I only went over-budget two days of the entire month. The grand total for one month was $957.60 or just under $31 per day. This is as a woman in my late 20s, traveling solo for two weeks, then traveling with a buddy for the second two weeks. Though most people say that solo travel is slightly more expensive than travel in pairs I would argue the opposite – this month anyhow. However, it is a bit hard to say since the latter two weeks included some big ticket items such as entry to the Angkor Wat temples, which made up a big part of my costs for the month. At any rate – not bad, eh? This is less than my rent alone back in Sweden. Accommodation: $230 Rooms ranged from $4 for a dorm with cold water and shared bathroom to $10 for a private room with ensuite and hot water. Food: $303 I ate way too much Western food, which was around $4-6 per meal. Local dishes usually ranged from less than $1 to $3, and in my opinion were often much tastier. One massive exception was the eggs benny at Espresso in Kampot, which was worth every penny, and even more so when I had a $2 cappuccino on the side. Transport: $92 This covered busses, minivans and shared taxis to and from six cities across Cambodia, as well as a catamaran ride to/from Koh Rong island and the odd tuk-tuk, taxi or motorcycle ride. 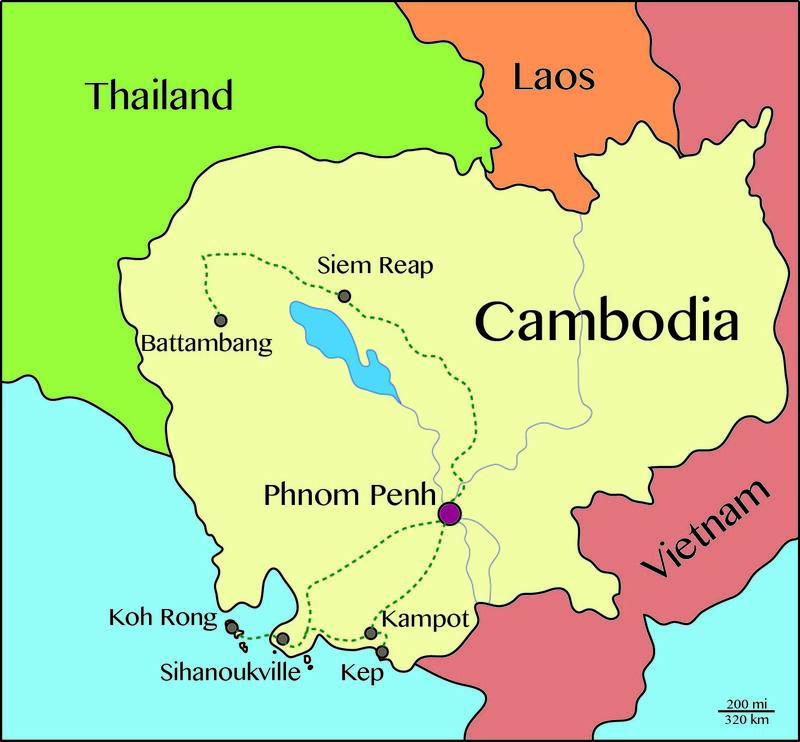 It is possible to cross a solid part of Cambodia (a 12 hour ride) for less than $10. Visa: $32 The visa itself was $30, then I had to pay a $2 ‘fee’ for failing to bring a passport photo to go with my visa application. Alcohol: $80 Cambodia is famous for its $1 beers. Sometimes they are $0.50. Sometimes they are $1.50. Cocktails are usually about $3. At any price, alcohol is routinely how one makes friends at a hostel. $80 would buy me about 10 beers at a bar in Sweden. In Cambodia it had me damn near pickled. Time to cut back, more for my liver than my budget. Entertainment: $157 Motorbike rentals plus petrol went into this category (really more fun than ‘transport’ in my opinion), temple entry fees, tours, a cocktail making course, a day at the pool, a boat trip and visits to the killing fields, S-21 and the Royal Palace. Miscellaneous: $64 This included laundry, some clothes (2 pairs of pants, 3 shirts, a hat and a sarong), four books, postcards + stamps, a SIM card, bank withdrawal fees and a traffic fine for driving the wrong way down a one-way road (a hefty $1, which went directly into the cop’s pocket). This month could have easily been as low as $750, and if I really tried I probably could have gotten by on less than $600. If I would have spent the full $1200 I had budgeted for the month I would have been living in the lap of luxury – but I’d rather save that money for something down the road – flights or days diving. So for now, this is how I afford to travel. I have savings, which I am slowly going through. I have a job, which is slowly topping up my savings. Eventually I’ll break even and who knows – even become sustainable. But for now, a monthly budget that is lower than my rent at home seems to be the best way to get my small business on its feet without bankrupting myself. Next up – let’s see if Thailand is as gentle on my pocketbook! I took a 4 month trip through Europe when I was about your age and kept a minimal journal. I read it last year for the first time in a few decades. While it was tremendously fun to read and brought back many forgotten times, I was frustrated at the lack of details about some of the places and people I met. If you are lucky enough to arrive at the age I have attained, you will treasure every word of your blog. I would like to put together a map of my trip and am wondering what program you used to create the map in your budget breakdown. Hi Rick – glad you are enjoying it! I’m doing my best to keep on top of it, but like you said it is easy to leave out details about places and people. There is so much to take in and it is nearly impossible to get it all down, but at least a snapshot is better than nothing at all. I had an earlier post about the value of journaling – even a few years later it brings back so much. Can’t wait to look at my journals twenty.. thirty.. or fifty years from now. I actually made the map myself in Adobe Illustrator (hence only ‘my’ cities being on the map, and personal colouring and routes). Illustrator has a pretty steep learning curve though and takes some time, so if you don’t know how to play with it I would recommend starting somewhere else. I know you can put together a basic map pretty easily in Google Maps using the My Maps function, and there are other online programs like Traveller’s Point that can make pretty maps. If none of these work let me know and I can make an Illustrator map for you! This article is an eye-opener. Cool ap too! Super interesting!! And now I have to check out that app… Thanks for sharing! Glad you enjoyed it! I guess I should mention the app isn’t free if you want to add more than a few items (something like $5 if I remember correctly), but was money very well spent!